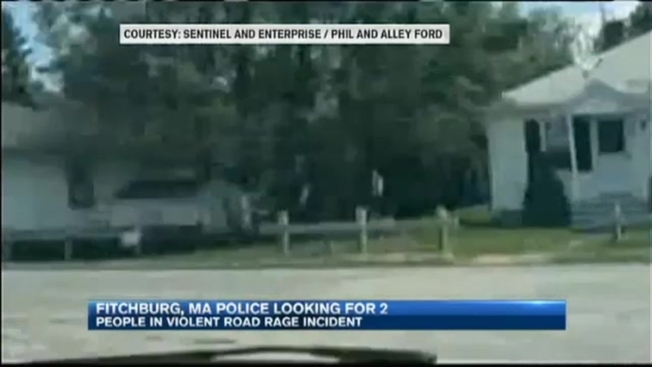 Punches were thrown and a motorcyclist was attacked with a bat in an incident of road rage caught on camera in Fitchburg, Massachusetts. The incident happened Monday morning on South Street. According to the Sentinel and Enterprise, a father and daughter were driving when they saw a motorcycle cut off another car. The father asked his daughter to record the reckless driving with her phone. They say the incident sparked frustrations between the two drivers, who began yelling at each other. They then pulled off the road to another street. The video shows the man on the motorcycle appearing to punch the other driver, who gets out of his vehicle and attacks him with a bat. In the end, both walked back to their vehicles and left the scene. Police are searching for the two involved in the incident. Anyone with information is asked to contact Fitchburg Police at (978) 345-9648.